Early Learning Coalition of North Florida volunteer reader Karen Cercy dressed up as a clown for Halloween with her class at Backpack University in Orange Park, Fla.
ORANGE PARK, Fla., November 20, 2018- The Early Learning Coalition of North Florida (ELC) is seeking new volunteer reading pals to continue growth for their Reading Pals program. Volunteer Reading Pals are matched up with local preschool centers where they read once a week or bi-weekly to groups of children. The ELC has a specific need currently for more volunteers in Clay County. Reading Pals volunteers will learn the following skills: how to choose age-appropriate books; child development, including the attention span of preschoolers; presenting books to preschoolers and promoting early literacy through phonetically reading. 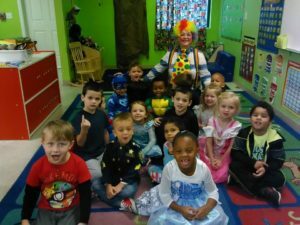 “It makes my day when I walk into the classroom and the children cheer ‘It’s the book lady,’” volunteer Reading Pal, Ellen Prest said. Studies show that the best opportunity to influence our children’s lifetime learning is before kindergarten when their most rapid period of brain growth occurs. Instilling an early love for reading is crucial to children’s future success in school. The ELC has a well-stocked lending library with books and literacy materials for the volunteers to check out and use. Readers are also able to create relationships with the children through their consistent appearances. Volunteers can read solo or they can share their assignment with a partner. The ELC has several husband and wife teams as well. Civic organizations have also adopted a classroom and members take turns reading. The Early Learning Coalition is the leading voice in six counties for child care. ELC works with many other local agencies to ensure that all families have access to quality, affordable child care. Their mission is achieved by leading projects that increase the quality and availability of child care professionals, and advocate child care policies that positively impact the lives of children and families. To learn more about the Early Learning Coalition of North Florida and how assist in ensuring quality child care for all families, visit us at www.elcnorthflorida.org.